Click the banner and start playing daily fantasy today! Edwin Encarnacion play of the day! Wil Myers homered twice and drove in four runs. Myers is 18 for 38 with four home runs and 11 RBIs during a nine-game hit streak. Jeff Keppinger is 16 for 35 in the season series against the Indians and 6 for 10 against McAllister. Pedro Alvarez is 12 for 21 with two doubles and two homers against Westbrook. He's batting .296 while hitting safely in seven straight games. 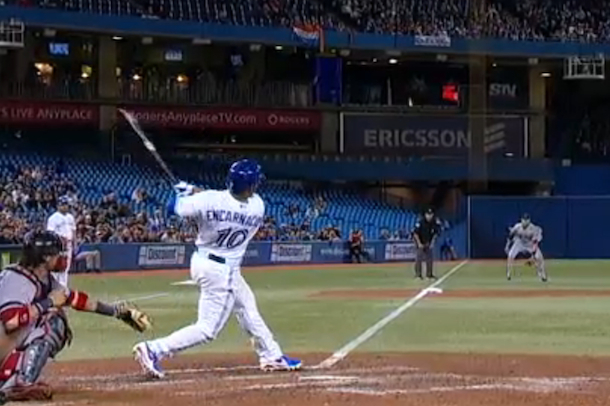 Edwin Encarnacion went 9 for 12 with eight RBIs in the Houston series. He's hit .391 (9 for 23) with two homers and five RBIs in his last six games against the A's.